Product #16696 | SKU CAB-HD-LCK-01MM | 0.0 (no ratings yet) Thanks for your rating! 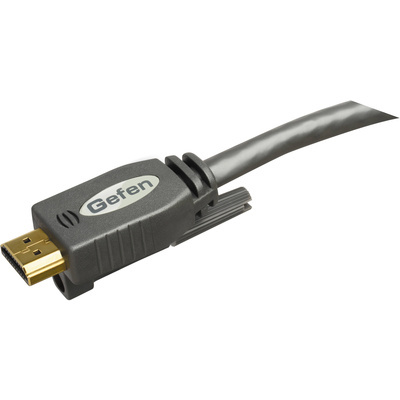 The Gefen High-Speed HDMI Cable with Ethernet and Mono-LOK is a 1' / 0.3 m copper-based cable and is designed for use in highly demanding installations. It provides a secure and fixed way of connecting the source and display. The cable supports all HDMI features, including an Ethernet connection through the HDMI cable, Audio Return Channel, 3DTV, and up to 4K resolution. Supports HEC (HDMI Ethernet Channel), which consolidates video, audio, and data streams into a single HDMI cable. It provides signal quality and convenience of HDMI connectivity, as well as the power and flexibility of home entertainment networking. It incorporates a dedicated data channel into the HDMI link, enabling high-speed, bi-directional networking at up to 100 Mb/s. Supports HDMI ARC (Audio Return Channel), which enables a TV, via a single HDMI cable, to send audio upstream to an A/V receiver or surround audio controller. This increases user flexibility and eliminates the need for any separate S/PDIF audio connection. Supports HD resolutions up to 4K (4096 x 2160) in sharp, vivid deep colour with up to 8 channels of embedded digital audio. It is tested and certified up to HDMI Category 2 (340 MHz). It has high-quality 28AWG copper conductors to deliver a pristine signal. The multi-layer shielding protects signals from EMI (electromagnetic interference), and the proprietary Mono-LOK technology provides a secure HDMI connection.